Below is what it looks like when rendered. Do you have a good photo of the real color (on a LEGO part)? You might have a point, looking at this 3005, there is a clear difference between the element / photo and the rendered ldraw image. I will check more tomorrow, if needed, we will change the color code and I will re-render about 750 ldraw images. I am really glad you mentioned this - if there are any other colors that you think might be wrong, please let me know! Done some research: according to Ron Howerter, the RBG value for Dark Purple (LEGO Medium Lilac) should 441a91, which is not what we're using. Below one of Ron's photos showing some parts in this color. While I agree that there is a little difference between our Dark Purple and LEGO's Medium Lilac, I do not feel this difference warrens an immediate change of our color definition. 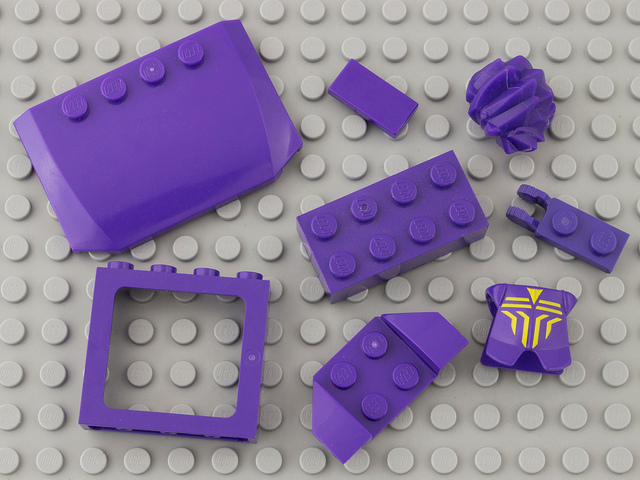 I might, somewhere this year, re-render all Dark Purple images with the official LEGO color, but for now, I think we can live with the difference.